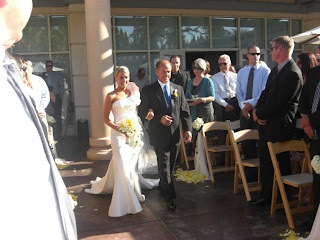 Then I Got To Thinking...: Happy Birthday, Dad! The most incredible, genuine, compassionate, hard working guy I know. I am so lucky to have such a great dad. Happy 55th Birthday on 9-9-09. You are so special to everyone who knows you. You are the best dad in the world!! Happy Birthday indeed Papa Tracy!! I remember your beautiful post about your dad and his retirement... so glad you have such a wonderful and caring and generous dad!! And you can see the pride and love that he has for you in his eyes and his smile while he was walking you down the aisle!! What sweet pictures! You tell how happy he is for you. totally been behind on blogging but your dress is amazing and I cannot wait to see more pictures of your wedding!! Oh and Happy Birthday to your dad! How funny, my son was 4 yesterday, they share a birthday!! Happy Birthday to your dad! What a fun birthday this year! Hello - what a lovely post ! Your site is really interesting to. Thank you for sharing it, best wishes and.... lovely to meet you ! your dress is gorgeous girly!! Love those pictures of you two! Happy birthday to your dad! oh yay for dads. happy birthday dad! girl.. and your looked fabulous in your dress. i can't get over it. very nicely done. Aww, those are the best pictures of you and your dad! 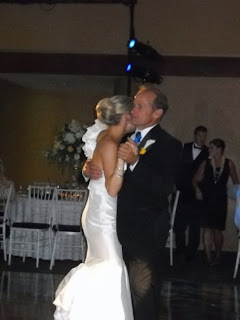 My dad will be 55 too, hope he has a wonderful birthday and that you are enjoying your honeymoon love! 1) Happy birthday to your daddy! 2) CONGRATULATIONS!!!! Your wedding looks SO beautiful so far. The dress is amazing!! You look gorgeous! WOW! MAY YOUR DAD HAVE A WONDERFUL and BLESSED HAPPY BIRTHDAY AND MAY ALL OF HIS WISHES COME TRUE! 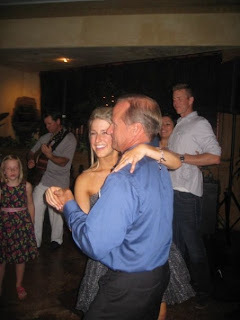 I love that shot of you dancing with your Dad ~ what a wonderful memory for you to carry with you forever! I hope your Dad had the best birthday ever.